This is an odd cartoonish papercraft of Disney's Herbie the Love Bug. I am not sure of the origin of this model. I assume it was originally produced in the 60's or 70's as a publicity item for one of the series of Herbie movies that were released at the time. 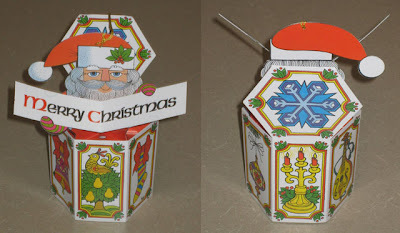 The instructions included with the template seem to indicate that it was intended for children and that it was probably printed on the back of a box of some kind. The 3D decoupage-like design of the fenders causes the Beetle to look somewhat strange when seen directly from the front or rear. A free download of the Beetle is available here. 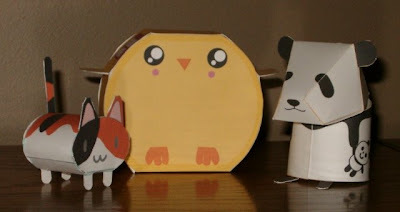 Many miniature gaming fans are turning to papercraft as a way to enhance their game play. These are two fan produced papercraft props for the Star Wars Miniatures game produced by Wizards of the Coast. 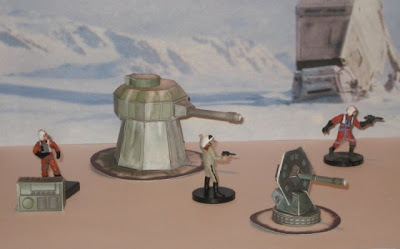 The turret and cannon orginally appeared in the 1980 movie, The Empire Strikes Back. The templates for these pieces are available here. This papercraft Beetle is unusual in a couple of ways. First, it is a hand drawn template, something that has become relatively rare in our computer age. Second, even though the Beetle is known for its rounded profile, the designer chose to use a boxy shape for the model. The template for this model is available from the Antique Automobile Club of America on their website. This is the first in a seven part series of my builds of various VW Beetle papercraft. I hope to have all seven builds posted in the next several weeks but there are likely to be some other posts that will interrupt the series from time to time. :) This Beetle is by Mitsuaki Ohashi, Japan, 1999 and can be downloaded here. For a template with only two parts it achieves a good three dimensional shape. One quirk I noticed with the template is that one of the backup lights on the rear of the Beetle is white and the other is red. Twenty three years before Peter Jackson created his version, Rankin/Bass produced their 1980 made-for-televison, animated version of Tolkien's Return of the King. This papercraft is my rendition of the "Phial of Galadriel" as it appears in the Rankin/Bass version of the story. The Phial of Galadriel is a small bottle which the Elf queen Galadriel gives to the Hobbit Frodo Baggins to assist him in his quest. The phial is capable of magically emitting a bright star-like light. Galadriel describes the phial as "a light for you in dark places, when all other lights go out." 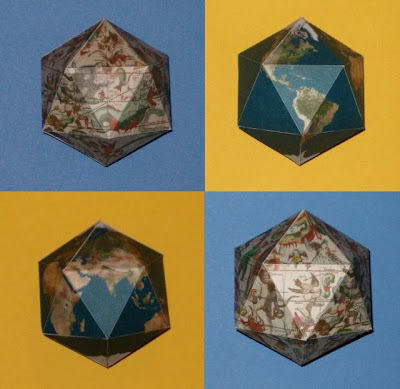 I came across an interesting website where you can upload any image and it will output a template of the image mapped onto an icosahedron. Above are photographs of two models I created using the website. For the first model I input a satellite image of the entire Earth. For the second I input an image of an 18th century European map of the celestial sphere which shows artistic representations of the constellations. Each model is about 3" across and they were each constructed with cardstock and double sided tape. To try it yourself, go to http://www.hirax.net/map/. 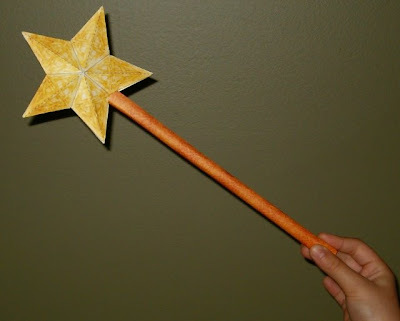 Here is a nice magic wand papercraft that designer Marilyn Scott-Waters offers as a free download on her website. It is difficult to capture in a photograph, but both the star and the handle have a subtle Celtic knot pattern. The star is roughly 4 1/2" (11.4 cm) across. 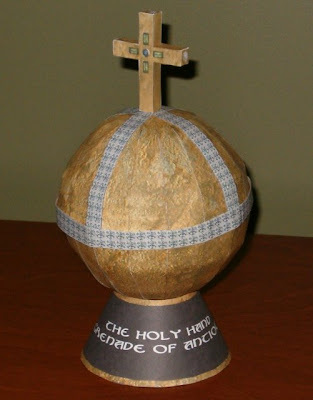 Without the handle the star would make a good Christmas tree ornament or even a topper for a smaller tree. Marilyn designed the wand in 2007 and it may be downloaded here. In addition to the color wand pictured above, there is a black and white template available that you can color yourself. "Funny Cats" (there are several designs available) by Yuuku, Japan, 2004 which can be found here. "Goldie Chick" by Tadan, Sweden, 2007 which can be found here. Panda by Toylava, Japan, 2006 which can be found here.